Home » Online Real Estate School • Real Estate » We are now the official education provider for Encore Realty! We are now the official education provider for Encore Realty! 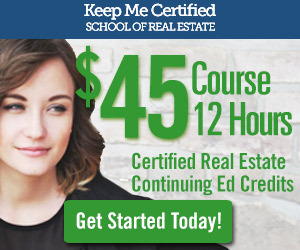 Encore Realty is pleased to be working with Keepmecertified.com as our exclusive outlet for online Boston real estate continuing education. At Encore, we strive to keep our agents on top of every aspect of the Boston real estate market both professional and ethical. Through the in-depth and user friendly online continuing ed provided by Keepmecertified.com, we can achieve this goal. The Brookline real estate market is heavily competitive. A brokerage and its agents must provide not only a quality product, but excellent customer service as well. This begins by having the proper experience and knowledge base. A real estate agent must be diligent in their efforts to stay abreast of changes in not just MA real estate law and protocol, but the ever evolving landscape of online marketing and technology as it pertains to our clientele. Online continuing education provides a means to accomplish this. It should be viewed as a means of improving oneself as a real estate professional, not just a part of license renewal process. As one of leading agencies for Brookline condo sales and rentals, Encore Realty believes we have set the bar higher by retaining Keepmecertified.com as our resource for continuing education. Our agents are trained to handle any real estate transaction from residential, to commercial, to property development. We will continue to offer our Brookline real estate clientele only the best service, now improved by our relationship with Keep Me Certified.